Mr. Gonzalez is President and Founder of both MGM Consulting and MGM Capital. 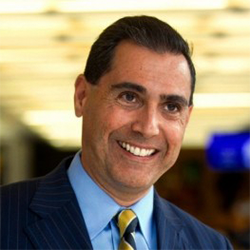 Prior to starting his own companies, Mr. Gonzalez spent twenty-three years in various leadership positions in marketing, sales, operations, and innovation at Procter and Gamble (P&G) in the U.S. and Latin America, including as Corporate Vice President. He was the first Hispanic to reach the vice president level in a US commercial function in P&G's 170 year history. Active in the community, Mr. Gonzalez serves on the board for many organizations including as Chairman of the Board of Advisors for Center for Leadership at Florida International University. He also sits on the Board of Directors for SofBoost, Inc., New America Alliance, and Alfalit International, Inc., and the Advisory Board for BBVA Bank. In recognition of his dedication to the community, Mr. Gonzalez was awarded the Hispanic Health Leadership Award in 2014 by the National Hispanic Medical Association/National Hispanic Health Foundation at the New York Academy of Medicine in New York, NY. The Hispanic Health Leadership Award is presented to outstanding individuals who have served in significant leadership roles and have improved the health of Hispanics and other underserved populations. Mr. Gonzalez obtained his undergraduate degree from Cornell University where he received the prestigious Irving M. Ives award. He completed his Master's degree at Harvard University, graduating as a Kennedy Fellow and also was a visiting scholar at Pembroke College, Oxford University in England.